Russian manned spaceplane. Study 1960. Myasishchev single-pilot winged spacecraft of 1960, sized for launch to orbit by Korolev's Vostok booster. Status: Study 1960. Payload: 700 kg (1,540 lb). Gross mass: 3,500 kg (7,700 lb). Unfuelled mass: 3,380 kg (7,450 lb). Height: 9.40 m (30.80 ft). Span: 7.50 m (24.60 ft). Following the very critical review of the first M-48 spaceplane design by the expert commission, Myasishchev developed a long range plan. The first stage of the R-7 would be used for preliminary tests. A new launch vehicle would be developed for orbital testing. Myasishchev directed his staff in attacking the questions raised so as to close all of the open issues at the earliest possible date. In addressing the question of the form of the VKA, OKB-23 studied many variants, including Taganov rings, extendible shields, Rogallo wings, and the use of vertical landing. Various kinds of construction and heat shield materials were examined, as were the methods of integrating the shielding materials to the structure of the vehicle. Liquid metal cooling was considered in addition to passive thermal protection systems. New propellants were examined for the rocket engine, including hydrogen and fluorine oxidizers. A great deal of technical effort was spent on the encapsulated ejection seat system, the mass of which, including parachute, could not exceed 160 kg with exterior dimensions of 0.8 m x 1.8 m. The seat would have to accelerate at 25 G from the vehicle, operate at temperatures of -40 degrees C to +50 degrees C, from sea level to vacuum conditions. The seat had to ensure the safety of the pilot, ejecting him within 2 seconds after initiation through a hatch of 1.0 m diameter. Work on development of the hot structure of the unpiloted M-42 missile was found to be directly applicable to the . The spacecraft structure, built of steel and titanium, would have to endure sustained temperatures of 350 degrees C. The heat shield system would have to protect the pilot from temperatures of hundreds of degrees during ascent through the atmosphere and over a thousand degrees on re-entry. The material selected to endure re-entry conditions could handle re-entry temperatures of 1,500 degrees C at peak heating load, cooling to 1,100 degrees C on landing. VIAM (All-Union Institute of Aviation Materials) worked to identify appropriate materials. The thermal protection layer of the VKA consisted of tiles, composed of a silicium-graphite skin, within which were niobium alloy diaphragms injected with ceramic foam. This method of construction was patented by Ye S Kulaga and Ya B Nodelman. Various solutions were found to fasten the heat shield tiles to the frame. The same techniques would be used twenty years later on the US space shuttle and Soviet Buran. In March to September 1960 this work resulted in two definitive configurations being defined. It would seem that these designs were now single-pilot spacecraft, sized for launch to orbit by Korolev's Vostok booster. In both designs equipment (navigation and guidance, communications, life support, electrical, telemetry) was kept to 600 kg. Useful payload was 700 kg. Equipment developed for Korolev's Vostok spacecraft would be used in the VKA-23, including the Zarya communications system. The flight profile was as follows: to 11 km altitude the cosmonaut could use the ejection seat in the event of launch vehicle problems. Thereafter the VKA would separate from the booster. From altitudes below 40 km during re-entry the vehicle would be maneuverable. The pilot could eject from the spacecraft from the altitude of effectiveness of his parachute system: 3 to 8 km for the main chute, or 2 km for the reserve system. The VKA would automatically land at 10-12 m/s vertical velocity on ski landing gear, which had a length of 1.2 m, width of 0.25 m, and a track width of 5.6 m. The cosmonaut would eject from the VKA before landing and return separately to earth by parachute as in Vostok. 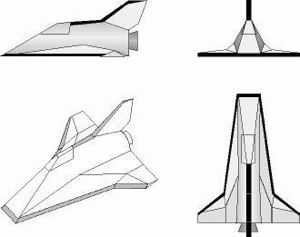 Although primitive, the design was the first step toward later reusable spacecraft like the shuttle or Buran. OKB-23 also designed a launch vehicle for a second stage of the program. This would be a three-stage vehicle of tandem layout. The first stage consisted of a cluster of four blocks, each with 7 engines of 35 metric tons thrust. Total lift-off thrust was 980 metric tons, 2.4 x more than Vostok. The first version of the VKA-23 was a faceted design equipped with ski landing gear. It would evidently use Nonweiler shock-wave riding principles to minimize re-entry heating. In October 1960 Kremlin intrigues led to Myasishchev's design bureau being dissolved. OKB-23 became Filial 1 of Chelomei's OKB-52 and all work on the VKA-23 was stopped. Myasishchev left to become head of TsAGI (Central Hydrodynamics Institute). However the OKB-23 design team provided the experienced core for development of manned winged spacecraft by Chelomei under the Raketoplan project. Crew Size: 1. Habitable Volume: 0.90 m3. Spacecraft delta v: 100 m/s (320 ft/sec). Family: Space station orbit, Spaceplane. Country: Russia. Launch Vehicles: R-7. Agency: Myasishchev bureau. Bibliography: 192, 81, 83. VKA-23 Design Alternate 1. M-48 configuration that preceded it is believed to have been a similar faceted design. 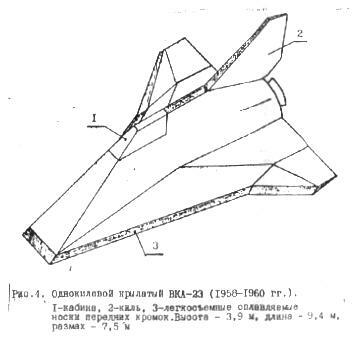 VKA-23 spaceplane. - . Nation: Russia. Related Persons: Myasishchev. Spacecraft: VKA-23 Design 1, VKA-23 Design 2. Following the very critical review of the first M-48 spaceplane design by the expert commission, Myasishchev went back to the drawing board. In March to September 1960 this work resulted in definition of two alternative configurations. The first alternative was an unconventional faceted shock-wave riding design (see VKA-23 Design 1). The second Myasishchev VKA-23 design was an elegant-looking, porpoise-fuselaged winged vehicle. 1960 October 1 - . Ongoing winged manned spacecraft project cancelled - . Nation: Russia. Related Persons: Myasishchev, Tsybin. Class: Manned. Type: Manned spaceplane. Spacecraft Bus: VKA. Spacecraft: VKA-23 Design 1. In reduction of military-industrical complex, Myasishchev and Tsybin design bureaus are closed and work stopped on the three prototype winged manned spacecraft already built..